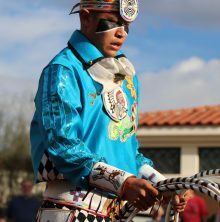 Tyrese Jensen (Navajo / Maricopa) of Dilkon, Ariz. earned 237 points of a possible 250 to win his first adult world hoop dance title at the 27th-Annual Heard Museum World Championship Hoop Dance Contest. Tyrese Jensen, 18, was a first-time adult contestant this year. He landed a $3,500 cash prize, and added the adult title to his world titles in the teen and youth divisions. Jensen topped former champion Tony Duncan (San Carlos Apache, Arikara, Hidatsa, Mandan) of Mesa by one point; Duncan won a $2,500 prize. Terry L. Goedel, (Yakima/Tulalip), of Rancho Cucamonga, Calif. He repeated his 2016 win as senior champion, earning $2,500 with a total of 221 points. Nanabah Kadenehii (Dineh) of Big Mountain, Ariz., who won the teen division with 211 points, earning $750. Kailayne Jensen (Navajo/Maricopa) of Dilkon, Ariz., who won the youth division with 216 points, earning her a $350 prize. An estimated 5,000 people watched the two-day event; more than 5,000 watched the competition live on Facebook. Dancers were judged on their precision, timing and rhythm, showmanship, creativeness and speed. To earn a spot in the finals, dancers had to survive two preliminary rounds of competition. A “tiny tots” division for dancers age 6 and younger drew 13 participants. This year’s event also honored individuals who touched the Hoop Dance community. On Saturday, Valentino Rivera, a youth participant who passed in May 2016, was honored by his family, the community of Pojoaque Pueblo, and the Heard Museum. Also, trustee, Hoop Dance enthusiast and sponsor of the teen division Jeff Kahn was honored by the museum and his family for his contributions to the World Championship Hoop Dance Contest. On Sunday, Glen Ahhaitty was honored for his years of dedication to the hoop dance contest. Ahhaitty was one of the first to sing at Hoop Dance and his vocal influence on the judges set a high caliber for all who sign today.